Just before Thanksgiving last year, the U.S. Small Business Administration’s flagship loan program, which provides banks with a government guarantee of up to 90 percent of the value of loans made to small businesses that fall just shy of qualifying for a standard bank loan, ran out of money. SBA loan guarantees are arguably one of the most efficient uses of stimulus funds. The $325 million included in the Recovery Act of last February covered the cost of backing $16.5 billion in loans to small businesses. Yet, as loan volume spiked in the fall, reaching pre-recession levels, Congress let the pipeline run dry. Within weeks, more than 1,000 small businesses found themselves in loan purgatory: their loans had been approved, but banks couldn’t release the funds. Such a turn of events seems unconscionable amid a recession. But it’s about to happen again. An additional $125 million appropriated in December will run out toward the end of February unless the Senate moves quickly to approve legislation that would support SBA loan guarantees through the end of the year. These days, all eyes are on small businesses, and for good reason. They’ve created the majority of new jobs over the last decade and, in past downturns, it’s been small business growth that has pulled us out of recession. Other research has found that, all else being equal, regions with a robust network of small, local banks are home to significantly more small firms. 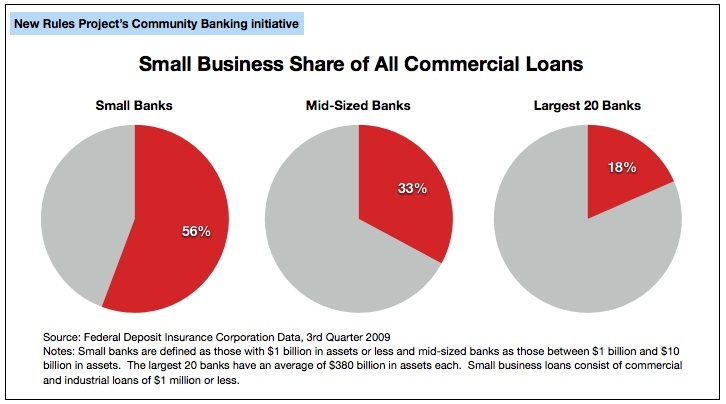 Why is it that community banks do so much more small business lending than their big competitors? One reason is that big banks rely on computer models to determine whether to make a loan. Because the local market conditions and the circumstances surrounding each borrower and his or her enterprise are so incredibly varied, this standardized approach does not work very well when it comes to understanding the nuances of risk associated with a particular small business. By drawing on qualitative information – getting to know the borrower, learning about the business, and understanding the local market – small banks can better assess risk and successfully make loans to a wider group of small businesses. “We don’t use credit scoring, where certain parameters about the business are put in and the computer says yes or no. We still rely on a thorough understanding of the financial information that the borrower brings us. You get to know the borrower and understand what the numbers mean in the context of that business,” said John Kimball, vice president of Park Midway Bank, a $272 million-asset bank in St. Paul, Minnesota. 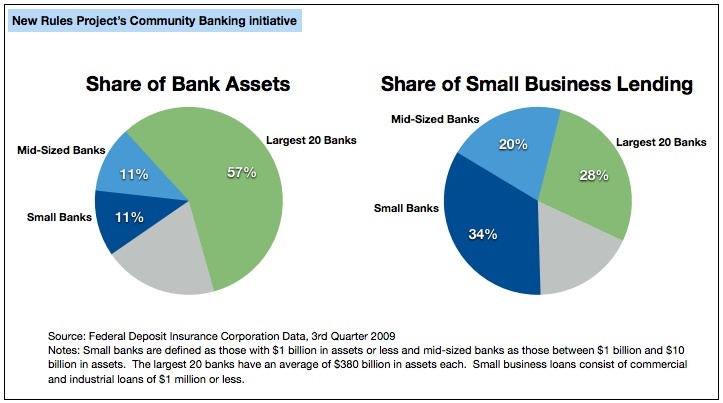 Small banks regularly finance businesses that big banks have turned away. Andrew Atwood, who sought financing last year to expand his auto repair business in Phoenix, was rejected by seven large banks. “It was a nightmare,” he said. “They had a ‘you’re lucky we’re even looking at you’ kind of attitude.” Then a customer introduced him to Sonoran Bank, a small, locally owned bank. “From the get-go they treated us like your next door neighbor,” he said. Not only did Atwood get the loan, but the rate, 5.25 percent, was lower than the 6.75 percent the big banks would have offered had he been approved. It’s no surprise then that the money taxpayers have spent over the last 16 months shoring up big banks has done nothing to free up credit for small businesses. To do that, we need to focus on expanding the lending capacity of small banks. The Obama Administration has finally grasped this, putting forward a flurry of proposals in recent weeks aimed at increasing the flow of loans from small banks to small businesses. Although some community banks will benefit from Obama’s plan to make $30 billion in low-cost capital available to them, for most small banks, the issue right now is not a lack of capital. Most small banks are in pretty good shape and have money to lend. The problem is that loan demand is down and many of the small businesses that are seeking loans are not creditworthy by standard measures. Their cash flow has been battered by the recession. Many no longer have equity in their homes or businesses to borrow against. Through no fault of their own, small businesses are operating in an economy in which they are more likely to fail and thus constitute much riskier investments. While SBA-backed loans constitute only about 8 percent of overall small business lending, they account for 40 percent of long-term loans and thus provide an essential source of patient capital for growing small businesses. Under the SBA’s flagship 7(a) lending program, which backs loans of up to $2 million that small businesses can use for working capital, equipment or expansion, the payback period is 7 to 25 years, a longer term than most standard bank loans. In the 12 months before the credit crisis, some 2,500 banks, mostly small community banks, made over 69,000 loans under the 7(a) program. Three-quarters were for amounts under $150,000, one-third went to minorities, and nearly 40 percent funded start-ups. In good economic times, fees paid by borrowers cover the cost of the program, including defaults. When the credit markets froze in the fall of 2008, the volume of SBA-backed bank loans plummeted to about half of normal. Big banks, especially, sharply cut back their lending. SBA loan volume at JP Morgan Chase, for example, fell 66 percent. The Recovery Act sought to bolster 7(a) lending by expanding the maximum guarantee from 75 to 90 percent of the loan and waiving the fees charged to borrowers. It worked: monthly loan volume climbed from $700 million during the darkest months of the crisis to an average of over $1.5 billion during the last six months – a higher volume than in the year before the collapse. Yet, despite the fact that SBA loan guarantees effectively and inexpensively address one of the most debilitating aspects of this recession – reduced credit for small businesses – Congress has allowed the program to run dry once already and is on the verge of doing so again in the next few weeks. Obama has called for extending the higher guarantees and fee waiver through the end of the year. The House has passed a bill to do so. And now, like so much of the legislative agenda, further action depends on the Senate.